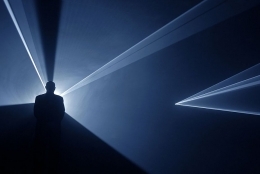 Sean Kelly is delighted to announce a major exhibition of new work by Anthony McCall, his first since joining the Sean Kelly Gallery. The opening will take place on Thursday, February 1st from 6pm until 8pm. The artist will be present. McCall's exhibition includes one of his most complex and large-scale installations to date. You and I, Horizontal (III) consists of a pair of three-dimensional forms of 'solid light', each thirty-five feet long, projected side by side from wall to wall in the Main Gallery. 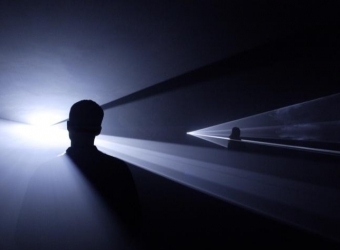 Anthony McCall is, without question, one of the seminal artists of American avant-garde cinema. 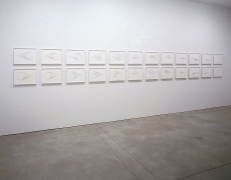 His films and installations from the seventies such as Line Describing a Cone, Long Film for Four Projectors, and Four Projected Movements, represent an extraordinarily corporeal and sensuous meditation on the medium of film and the politics of the audience's physical and conceptual relationship to it. All of these works took as their starting point the irreducible, necessary conditions of cinema: projected light, and real, three-dimensional space. 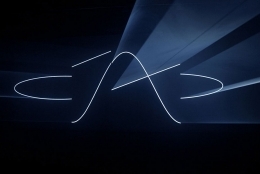 Philippe-Alain Michaud, the Film Curator at the Musée National d'Art Moderne, Centre Georges-Pompidou, writing about Anthony McCall's work stated: "Instead of a perspectival, illusionist space that brings cinema close to painting, McCall's films use a projective space that makes it into sculpture. The film is no longer a projected image that bores a fictive depth into the surface of the wall, but constitutes an actual field that merges with the event of projection itself. In this way Anthony McCall's light-beams, outlined against mist, expanding upon the specifically plastic properties of film, cross the frontiers of cinema history to join the minimalist propositions of 1970s sculpture and rank alongside the geometric structures of Robert Morris, Sol LeWitt or Carl Andre, Dan Flavin's fields of color, or Fred Sandback's spans of colored yarn." Beginning with Doubling Back in 2003, McCall returned to the 'solid light' form. 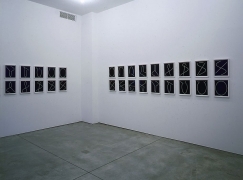 Since then, with works like Breath, Exchange, and Between You and I, he has developed a group of important new installations which radically expand on the earlier series. 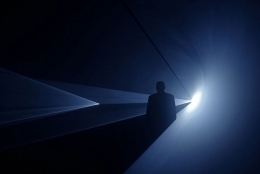 Anthony McCall's work is included in many major public collections worldwide including: the Tate Gallery, London, England; the Museum of Modern Art, New York, United States; the Musée National d'Art Moderne, Centre Georges Pompidou, Paris, France; the Whitney Museum of American Art, New York, United States; the Museu d'Art Contemporani de Barcelona, Spain; and the Museum für Moderne Kunst, Frankfurt, Germany.